In a country where 4 in 10 adults read less than one book written in their native language per year, an unlikely segment of the book market is thriving: English books for children. Lee Seung-a, an 8-year-old elementary student, is one contributor to this boom. Currently on a challenge to read 1,000 English books, she tries to read as many English titles as possible. Just past the 300-book mark at the moment, her absolute favorites so far are from the “Pigeon” series by Mo Willems. “They are easy but fun to read and they have large pictures,” mother Yoon Eun-ju explained on behalf of her daughter. It is Yoon’s job to ensure her daughter has a steady supply of interesting books to read. She mostly relies on local libraries and online bookstores, but when lucky, she grabs a boxful of used titles from local moms’ communities at a great bargain. “Sometimes she (my daughter) reads the same book – usually low level ones --- over and over again, but I still count each read,” Yoon said. It is a trend among Korean moms engaging heavily in children’s English education to encourage their child to set the number of English titles they aim to read, typically starting at 100 and eventually expanding to the four-digit figure, as a way to accelerate the language-learning process. The book challenge itself may be a new fad, but industry insiders see in it a broader shift in people’s approach to foreign languages toward one that emphasizes the power of reading. Hong Yoon-jung, an English-teaching-certified tutor who has taught young learners for nearly a decade, is one such believer. In the past, many Koreans thought only those who have reached a certain level of English proficiency could get their feet wet with the world of English books. But nowadays reading has become an essential -- if not the most important -- part of English learning from the very early stage, she explained. “In an EFL (English as a foreign language) environment, there is no better way to attain the maximum (English) input than through reading texts,” she said. What’s most important to parents, perhaps, is that reading is also cost-effective, given that private language institutes that provide English-immersive learning environment tend to charge costly tuitions. English-immersive kindergartens in Seoul typically charge over 1 million won ($890) in monthly tuition. Further evidence of the newfound interest in reading are the English libraries popping up across the country. Some are ordinary libraries as their name suggests where one can read and borrow books free of charge. Others are public but managed by private bodies through outsourcing, charging annual or monthly membership fees and running paid programs such as phonics classes. There are also a growing number of private services that call themselves “English libraries” that are in essence paid membership-based book clubs or book-focused after-school institutes. Mapo English Literacy Center belongs to the second group. 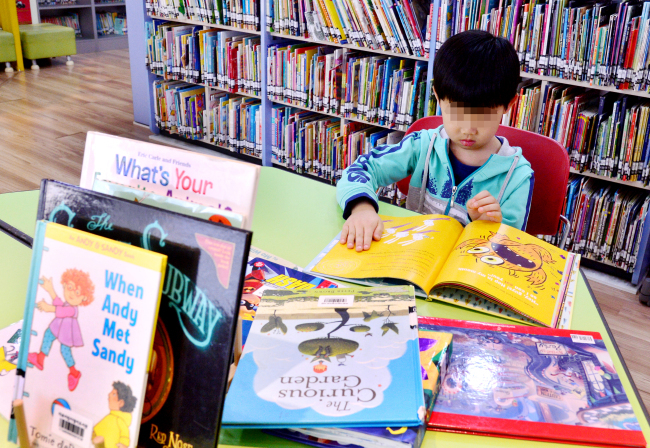 Established in 2009 by Seoul’s Mapo District Office, it was one of the first public libraries specializing in English books for children, according to Park Ju-young, head of the library. “When we first opened, we were unique. Many officials from local government authorities paid a visit at that time looking for a benchmark, I heard. Now there are so many libraries like ours,” she said, adding she was not with the library at the time of its opening. The Mapo library currently carries about 20,000 titles and runs over 30 classes and programs both for child and adult learners. “Until last year, we charged an annual membership fee of 30,000 won for those who wanted to check out books, but the district office decided to cover all the expenses from this year, and it’s completely free of charge now,” Park said. All this cannot be bad for book publishers. Scholastic, the global children’s publisher best known for “Harry Potter” and “The Magic School Bus,” sees “tremendous potential” for growth in Korea due to growing awareness among Korean parents on the importance of reading, said Amy Lee, who leads the company’s Korean unit. Korea is now the company’s second largest market in Asia, after China, she added. “Traditionally for Scholastic, books that are conventionally more academic had enjoyed higher sales. But today, we’re happy to see that Korean parents are also picking up more books for leisure reading at home for a fun learning experience,” she said. The recent boom has not come without criticism. Some people question whether young English readers are being given enough time or opportunity to dive into the world of reading in their native language, or whether the reading is voluntary. “As is the case in almost every field of Korean education, too much pressure -- or too much involvement of the parents -- kills students‘ desire for learning something new on their own,” said Jo Won-hyung, a retired high school teacher of Korean literature. An industry insider commented that the current boom in reading English books has been confined to kindergarten-to-elementary schoolchildren. And it is the same with Korean books. “From middle school, teens get on the race for university and focus on exam subjects. They have no time to read for fun -- either in Korean or English,” she said.